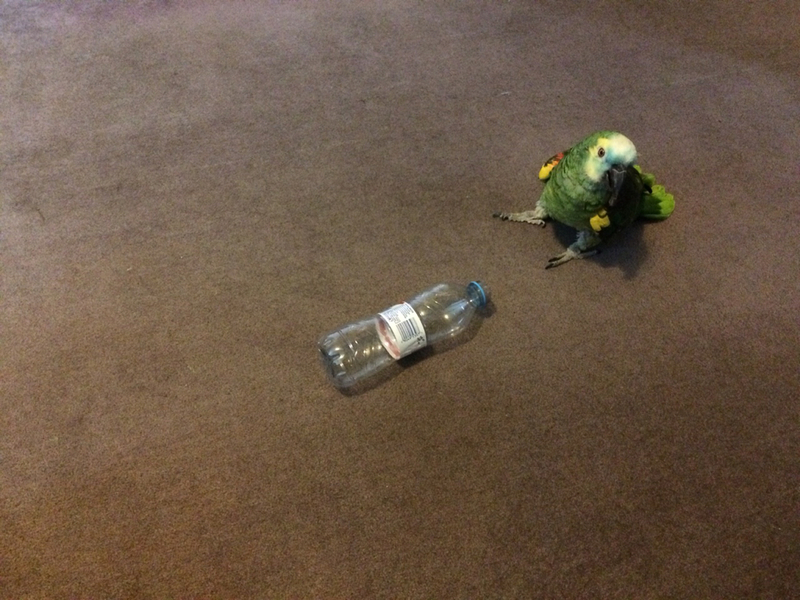 Tony put up a suggestion about giving birds empty plastic water bottles to play with and what a success it has been with Casper. He chases it around the floor and is getting lots of excercise. Once he has trapped it in a corner and given it a good bruising he just wanders off. Thanks Tony, all the expensive toys we buy just get ignored, this is brilliant and free. I'll post some photos or video soon, they will probably be blurred because it is all quite frantic. Last edited by Casper's 2nd best friend; 11-30-2017 at 10:29 AM. Casper is on a mission...lol. I use measuring cups and spoons from the dollar store and holy roller balls from the dog toy section. How cute he is! Did he manage to get the treat out of it? I have been drinking from half size water bottles so I can see if Lady would be interested as well. Haven't had the chance to try it yet. It takes her some time to get use to new objects so she has to be desensitized first.